(from page 26 of the 1970 Collection) Bright Yellow 1970 Mustang Shelby GT 500 fastback with a 335hp (at 5200rpm), 428 cubic inch, 4 barrel, Ram Air, Cobra Jet, V8 engine. This color was used from 1968 to 1971 and is also known as Grabber Yellow or Corporate Yellow. Corporate Yellow was a special order Mustang color for 1968, then Shelby used it as a standard color in 1969 and named it Bright Yellow or Grabber Yellow. So this is a Shelby carry over color from 1969. 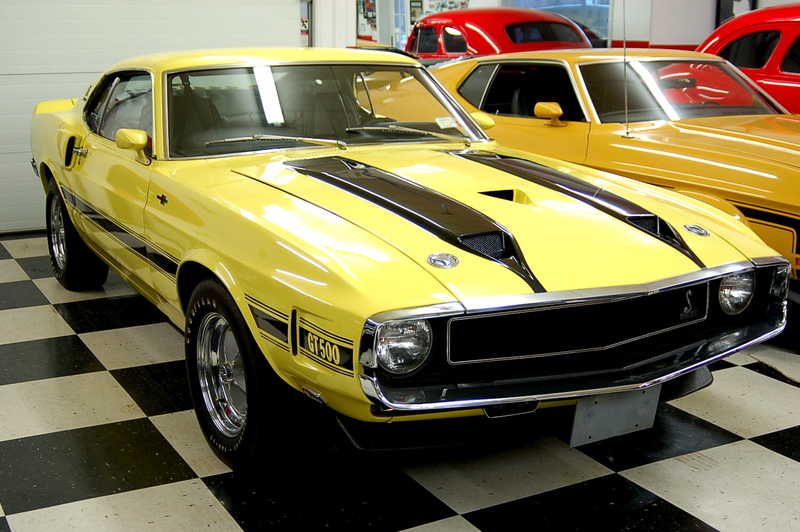 In 1970 Mustang made Corporate Yellow an official color but changed the name like Shelby to Grabber Yellow in 1971. A large desktop wallpaper is available for this view. (from page 38 of the 1970 Collection) Check out this Bright Yellow 1970 Mustang Grabber Special fastback! It has the unique black reflective Grabber "C" stripe on its sides. Other parts of the Grabber Special Package include an F-code 302ci 2bbl engine, body colored side mirrors, blacked out rear taillight panel, and 14-inch wheels with dog dish plain hub caps. The wheels have been swapped with Magnum 500 style wheels. (from page 38 of the 1970 Collection) This is a 1970 Shelby special color - also known as Grabber Yellow. (from page 38 of the 1970 Collection) The blacked out rear taillight panel is part of the Grabber Special Value Package.